Built in 1911 and the home of Thomas Brennan & Mary Anne Moran and their family until July 1996. 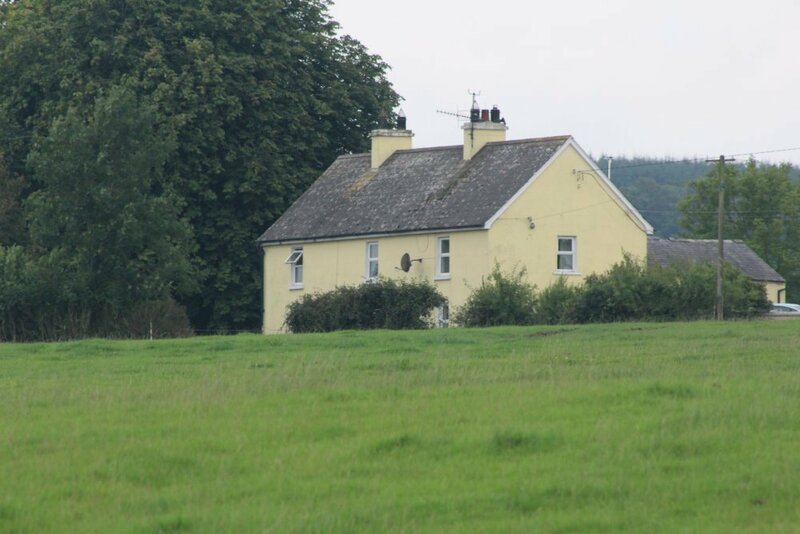 This is Part 1 of the Family History of my Great, Great Grandfather William Brennan and his descendants who lived in and around the villages of Woodland, Ballickmoyler, Ballynagall and Cooper Hill in the County of Laois (Queens County), Ireland. 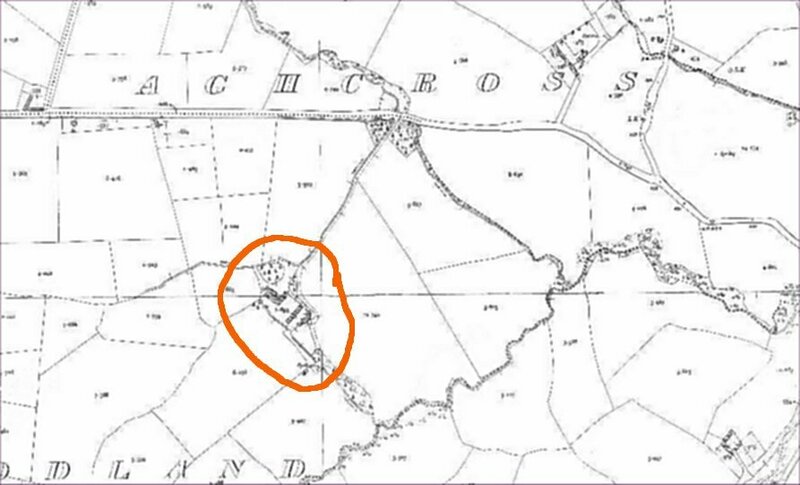 William Brennan, born c.1810 was a tenant farmer and rented large amounts of land in the Woodland & Ballickmoyler areas. I would be interested to hear from anyone who are releted to this family and may have information about my family, and the area that they lived in. I know that there are a number of my Brennan ancestors living in and around Carlow town and I would love to hear from them. Please feel free to contact me via my email address (below) if you think you have any information and you wish to share or questions to ask. Please Note: Not all of the information on this page has been verified by official parish records or official documentation except where stated. (Photo of gravestone (above) in Arles Graveyard taken by William Muldowney) c.2007). These images are of the original home of the William Brennan's family. The last member of the family to live in the house was Mary Brennan, the daughter of Denis Brennan who died 16 Oct 1918. 1. 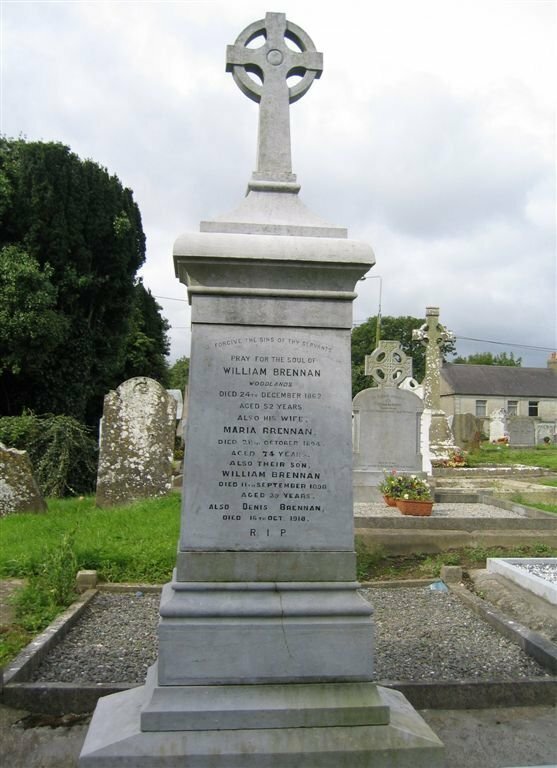 William Brennan was born c.1810, Woodland and died 24th December 1862 aged 52 years in Woodland, Co Laois. He married Maria Anne Walsh, on 2nd May 1839 in Ballickmoyler. *. Witnesses to the wedding was Martin King & Rev Denis Byrne. Maria was born c.1820., and died 28th October 1894, aged 74 years. (Source: Headstone inscription in Arles cemetery). i. ***Denis Brennan, b. 1841; d. 16 Oct 1918, Arles. Co Laois; m. Bridget Byrne. b. 1863. d 1939 aged 76. (Source: Headstone inscription in Arles). They had a daughter named Mary Brennan; b. c.1906 in Woodland, Co Laois. She married Ned Dillon. *Note 1. 16 October 1918 Denis died and left holding to widow Bridget. *Note 2. 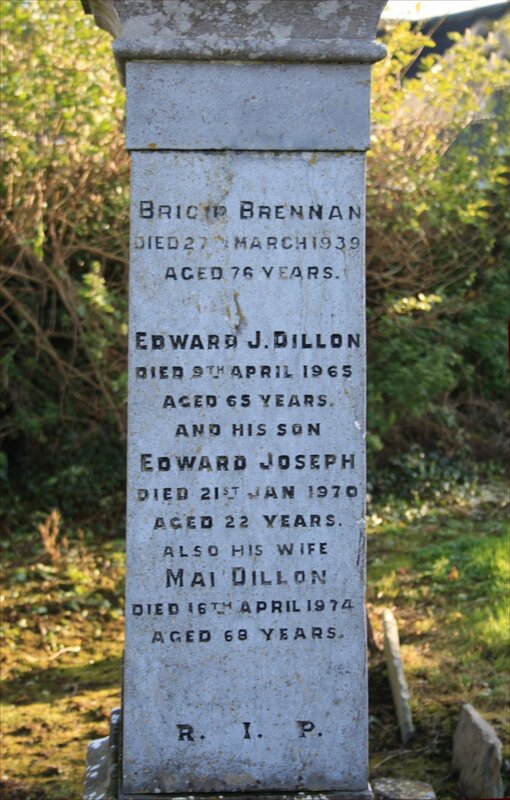 10 Oct 1918 Denis Brennan died will 9 Oct 1918, probate 27 Aug 1920, holding to widow Bridget for life and thereafter to daughter Mary Brennan. iii. Ellen Brennan, b. Bef. 1842, Ballickmoyler, Co Laois; d. Aft. 1874.
iv. */***Edward Brennan, b. 4th Apr 1844, Woodland, Co. Laois. Died 5th Sept 1929 aged 85 years. Edward Brennan was variously a curate at Tullow, Bagenalstown, Killeigh, Paulstown and Newbridge. He was parish priest of Mountrath from 1885-1929 and died on 5 September 1929. Aged 85 years of age. He appears in the 1911 census as Parish Priest in Mountrath aged 66. Notes for Edward Brennan: Birth appears in Arles Church Records of 1844. Sponsors: William King & Judy Neal. Your email to Knockbeg College seeking information about the above was passed onto me for response. Fr John McEvoy published a book in 1993 called Carlow College 1793-1993: The ordained students and teaching staff of St Patrick’s College, Carlow. According to this, Edward Brennan was from Arles, Co. Laois, and attended Carlow College between 1859-1861. He was ordained in 1867 for the diocese of Kildare and Leighlin. It seems he was ordained at Maynooth. According to another book I have here, an Edward Brennan matriculated at Maynooth on 25 September 1861 and was in the Humanity Class. According to the Maynooth book, he was ordained in 1866-1867. The Rev. Edward Brennan, the present pastor of Parish of Mountrath. Brother to Denis Brennan. Extract from Nationalist. Dated 29th April 1920. Denis Brennan late of Woodlands, Ballickmoyler, Queens county, Farmer, deceased. All persons claiming to be creditors or having any claim against the estate of the above named should contact John J. Duggan, Solicitor, Carlow. Denis Brennan was 77 years of age at the time of his death on the 16th October 1918. We regret to announce the death of Mr. Denis Brennan which sad event took place at his residence, Woodlands, Ballickmoyler on October 16th. The deceased, who was a brother of Rev. E. Brennan, P.P. 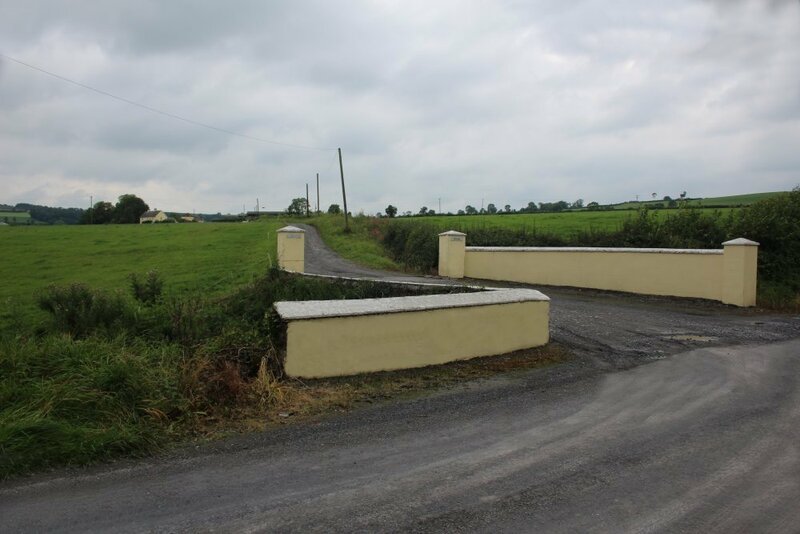 Mountrath was of a very kind and generous disposition, a good neighbour and a sincere friend. The chief mourners were -Rev. E. Brennan P.P. Messrs P.J. Carey, M. Doyle, and F. Lawlor. (brothers-in-law) T. Byrne, P. Byrne, E. Carey, J. O'Leary, nephews. There are no mention of any other brothers or sisters. Source: Email from Mick Purcell 3 Sept 2008. 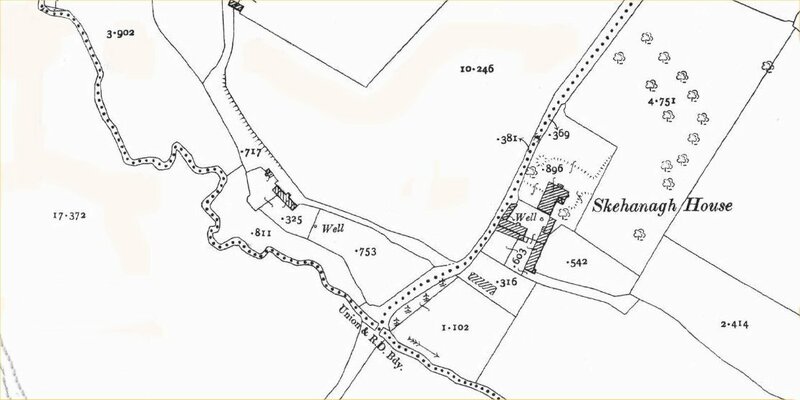 Map of Skenhanagh House. Co Laois. * They lived at Skenhanagh. Co Laois. i. William Delany, b. 05 Dec 1862, Skenhanagh. Co Laois; m. Maria Angus Conway, 04 Oct 1910, Cork; b. Date Unknown. Notes for William Delany was 48 years of age when he married. iii. Anne Delany, b. 29 Sept 1865, Skenhanagh. Co Laois. iv. Mary Josephine Delany, b. 25 Apr 1868, Skenhanagh. Co Laois. v. Johanna Delany, b. 10 May 1869, Skenhanagh. Co Laois. vi. **/***Charlott Brennan, b. 14 Jan 1849, Woodland, Co Laois. d. ?? Notes for Charlott Brennan: Mother Marie Walsh Father William Brennan Sponsor: Michael Coogan & Margaret Brennan. Location ****land. (Woodlands) - Entry found on Arles Baptism records for 1849 in http://www.laoisgenealogy.com/. She is listed in the 1911 census of Ireland as a Teacher and living in the Presentation Convent, George’s Hill, Inns Quay, Dublin. This facility is for the Religious Sisterhood for teaching the poor. She is aged 60. (Presentation Convent ~ Orphanage and N.S). Lucy became a Nun and her Religion name was Sister Mary Joseph Agnes and she was a full time teacher in the Presentation Convent and the Orphanage and N.S. She is buried in the convent plot in Glassnevin Cemetery Dublin. viii. *William Brennan, b. 29 Jun 1852, Woodland, Co Laois; *d. 11 Sep 1898, aged 46, Arles. Co Laois. (*Headstone inscription in Arles). Sponsors of his Baptism: James Wall & Margaret Kealy. ix. *Margaret Brennan, b. 19 Jan 1856, Woodland, Co Laois. d. ?? Sponsors: William Murray & Charlotte Brennan. x. */**Anne Brennan, b. 23 Aug 1857, Woodland, Co Laois. d, ?? In the 1911 census she is listed as living in Bagenalstown Convent aged 56 working as a School Teacher at 45 Regent Street. Bagenalstown, Carlow. At this time (2018) I have not been able to establish or confirm her details with the Convent. 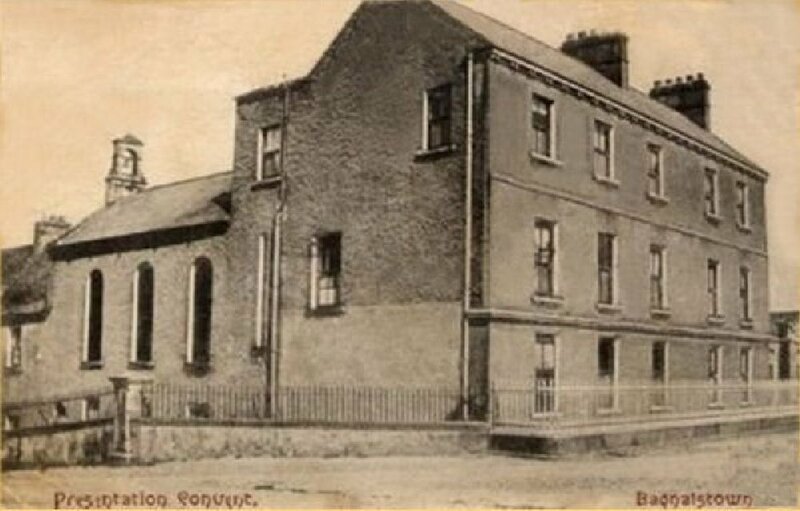 Bagenalstown Convent in Co Carlow where Anne served as a Teacher & Nun. xi. James Brennan, b. 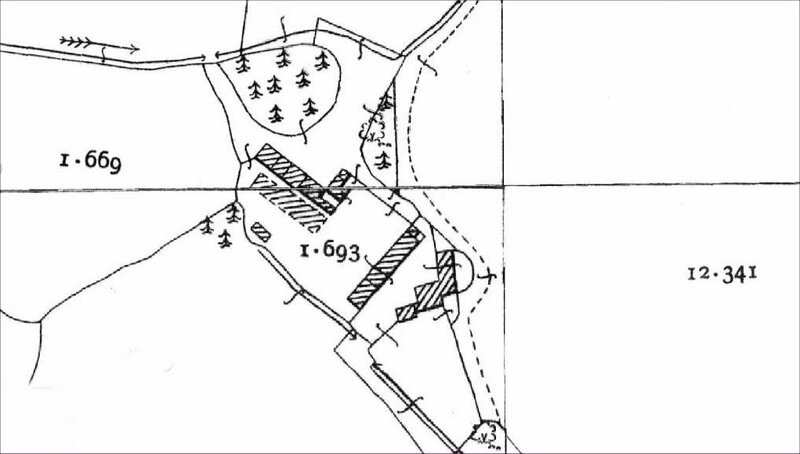 1858, Woodland, Ballickmoyler, Co Laois; d. 20 May 1915, Pollerton Road, Carlow. *** = Source: 1901 Census & Reg of B.M.D. Dublin found by Rita Murphy (Moran) 1999. The information contained in these pages is provided solely for the purpose of sharing with others researching their ancestors in County Laois.